Before receiving Cubetto, the thought of teaching computer programming to our young boys, ages four and six, never crossed our minds. Even though I am an engineer, I had not yet considered how to give them some basic tools that would perk their interest in STEM subjects, specifically computers. 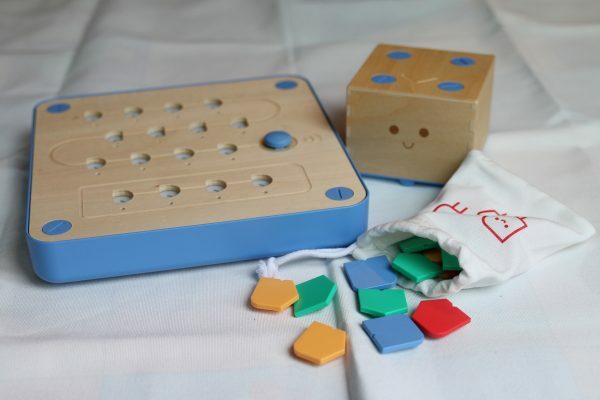 Our kids are as efficient as any out there on an iPad to navigate to their games or YouTube Kids, but actually learning computer logic wasn’t on our list of important things for them to be learning this summer…..until this little wooden cube named Cubetto from PrimoToys arrived. 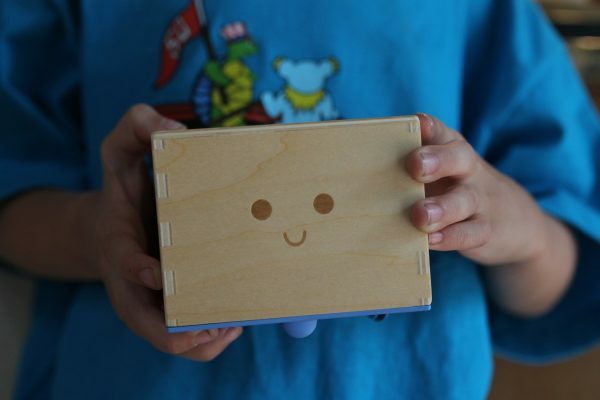 PrimoToys has come up with a very approachable platform for children to learn basic computer coding and logic, which my kids have taken to from the moment our new little friend was freed from his cardboard box. 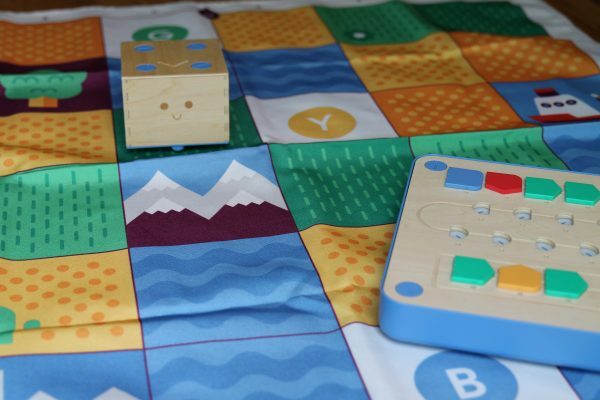 Being Montessori approved, Cubetto is every bit an educational toy but it is sly in its teaching through the use of stories and maps, which the children learn how to follow the story using coding to move the little robot across one of six large floor maps. What’s in the box? 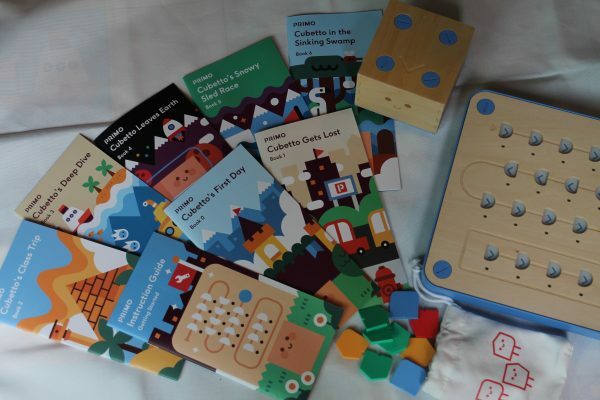 Included in the package is Cubetto, a little wooden robot, the control board, a bag of coding tiles and six floor maps, each with its own story and adventure. Each story starts you off on a designated square on the map and begins to lead you around the map. Your child’s job is to use the four different tile types to accomplish these tasks. Within minutes of unboxing Cubetto and selecting the first adventure, our six-year-old was navigating his new little friend all over the map with ease. Both my wife and I were astounded at how quickly he picked it up and knew what he had to do to follow the direction of the story. Our four-year-old is a little more abstract so he liked to try to make his own adventure, not following the exact story but was able to navigate Cubetto nonetheless. PrimoToys says this is for children ages three and up. This may be a little advanced for a three-year-old but I can see how they could still enjoy it with a little more help from a parent. Both of our children are now able to come up with their own adventures and design their own codes to play out their own stories when they want to go off script. Both of our children are enrolled in a Montessori school so this method of teaching fits right in with their school activities. Both of them have already said they want to bring it to school in the fall to show their friends and teachers the new skills they learned over the summer. Pros: Easy for kids to pick up and start playing and learning right out of the box and a great family activity that introducing coding and logic skills. A unique toy that teaches real life skills and builds a foundation for future education in computers. Cons: One thing that I would recommend to Primo is to add more coding tiles to the set. We often find ourselves running out of tiles before being finished with a task and having to break up Cubetto’s journey into multiple segments because of this limitation. It is also on the expensive side for a children’s toy but there are a few packages left on the Kickstarter page that offer some savings. Overall this has been a fantastic toy for our children, both as a family activity and something they can do on their own. I have already recommended it to friends for their children and will also recommend this product here. I am thrilled that our children have enjoyed it so much and are learning skills that can help them be better prepared as they continue their education. Source: The sample for this review was provided by Primo. For more info visit their site and their Kickstarter campaign to order one. Easy for kids to pick up and start playing and learning right out of the box and a great family activity that introducing coding and logic skills. A unique toy that teaches real life skills and builds a foundation for future education in computers. One thing that I would recommend to Primo is to add more coding tiles to the set. We often find ourselves running out of tiles before being finished with a task and having to break up Cubetto’s journey into multiple segments because of this limitation. It is also on the expensive side for a children’s toy but there are a few packages left on the Kickstarter page that offer some savings. Makes me smile when a toy “accidentally” teaches kids certain advanced concepts. My kids used to play with a Montessori toy that had 12 beads and 12 compartments. They could divide the beads into 1, 2, 3, 4, 6, or 12 groups and “accidentally” learn division while playing.